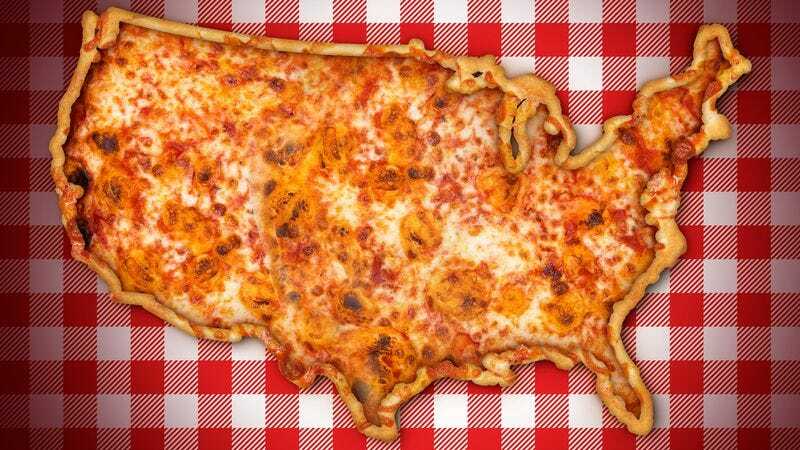 What region has the nation’s best pizza? Today is National Pizza Day, a made-up holiday conjured by Big Pizza’s propaganda arm. But it serves to remind us that America is not a pizza monoculture. A cheeseburger in New York might not be so different from a cheeseburger in Chicago, but the pizzas between those two cities are barely in the same category of food. Our pies—like our people—span many styles, shapes, creeds, and appearances. Every region has its own pizza patois, with syntaxes and phrasings so specific to its birthplace that it may as well be Esperanto anywhere else. But take your emotions out of it for a minute. Can we just say some pizzas are demonstrably better than others? The quality gap between the best and worst regional styles is a wide chasm. This doesn’t apply to any other food in America with the exception of maybe barbecue (but even with barbecue, we’re talking about a genre, not a specific dish). And frankly, some city’s pizza styles are half-assed ideas that get disproportionate championing in the name of civic duty. Every city thinks it’s the best in America, and we know that’s just not possible. The same goes with pizza. New York City is the best American city for pizza—a statement that is far from controversial. (Between Di Fara, Grimaldi’s, and Roberta’s, we could narrow that declaration down even further to Brooklyn.) The dough of New York-style pizza is crisp and thin but pliable, blistered to the edge of burnt in a scorching oven. There are tactile pleasures in folding its triangular slices up as a stream of orange oil drips down your inside forearm. Now that we’ve established that, we can expand outward from the five boroughs into the Tri-State region. There’s the bready, spongy, square pan-baked pies of the Sicilian style; the crunchier Grandma pies found on Long Island; and the sweet, chunky, tomato sauce-forward pizzas of a Trenton tomato pie—each providing their own unique pleasures. Up Interstate-95 in New Haven, Connecticut is the apizza (pronounce uh-beets) style, characterized by its freeform oblong shapes, its cornmeal-dusted verging-on-crunchy crusts, and most notably, the addition of minced clams and garlic as a topping. The town’s beloved Frank Pepe Pizzeria Napoletana is the originator of the white clam pizza, and it’s inarguably delicious. There are some extraordinary one-off pizzerias that adhere to the strict standards of the Neapolitan style (double-zero flour, buffalo mozzarella, San Marzano tomatoes). Many of these places are run by what glossy food magazines would call “fine dining chefs”—which means you can actually get a reservation on Open Table—as opposed to cash-only mom ’n’ pop joints with the perpetual line out the door. You’ll find some fine representation of the wood-fired Neapolitan style at Pizzeria Bianco in Phoenix, Sotto in Los Angeles, Cane Rosso in Dallas, and Spacca Napoli in Chicago. The pizza that gets talked about most in Chicago—at least by hotel concierges—might be deep dish, but most native Chicagoans actually opt for tavern-style pizza, such as the pies at Vito & Nick’s. It’s characterized by a thin, almost cake-y crust, topped with sausage and cheese and cut into a criss-cross square pattern, known locally as the “party cut.” It’s not far off from the St. Louis-style of pizza, which employs a local brand of cheese called Provel, a tangy and gooey blend of Swiss, white cheddar, and provolone. Frank And Helen’s just might be the city’s standard bearer. Then there are those regions whose pizzas that hardly even constitute a distinct style. We’ve never tried Ohio Valley-style pizza, but according to the blog Mine Road (via Serious Eats), the crust is focaccia and the cheese isn’t melted all the way. Lucky Peach also notes there is a pizza specific to the city of Buffalo—which is disappointingly not about spicy wing sauce, but rather pepperoni that curls under the broiler into grease-containing cups. With California-style pizza, popularized by Wolfgang Puck and perpetuated by California Pizza Kitchen, it’s actually more of a lifestyle. Here, the toppings are the star attraction, and—in typical Hollywood form—they can seem twee and ostentatious. Pears and gorgonzola. Thai chicken with peanut sauce. Goat cheese and duck sausage. Some of these may be delicious, but so is a Philly cheesesteak, if our definition of a pizza is hot meat on bread. That said, the biggest contribution California brings to our pizza culture is the combination of barbecue sauce and chicken as a topping. But most divisive of all is the Chicago’s deep-dish pizza, inspiration for comedy desk pieces, and a food consumed mainly by tourists and rarely by everyday Chicagoans. As a former Chicago restaurant critic, I (and most of my reviewing brethren) considered the deep-dish pizza a poor culinary representation of a city. These pies are hubcaps of dough, layered with thick sheets of sausage, cheese, and tomato sauce. The balance is out of proportion—too much crust, too much tomato tang—and you walk out of a deep-dish dining experience feeling like you’ve ingested five liters of hot grease and wet flour batter. One has to ask: If you can only consume with fork and knife, does it really fit into the definition of a pizza? Call it a “casserole” or a “meat cake,” but “pizza” is stretching it.